What can we make of a thing we call consciousness? How would we define the id in terms of form, shape or imagery? 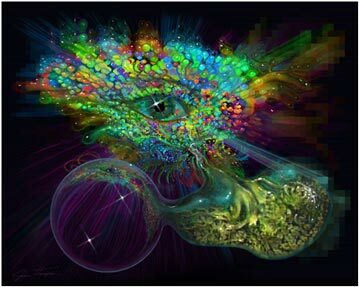 Here we might imagine the power of thought or awareness able to extend itsself with some creative force. The imposing spectacle of color, form and energy surrounding that ever-familiar symbol of the eye, may suggest facets of mind and soul that one can only imagine might give birth to some powerful means to achieve various ends. The combination of elements in which is seen some almost divine spark of communion with the beholder, might be just another form of relating thoughts and feelings that transcend physical differences. The exhibit of the almost universal form of the eye, radiating appendages or arrays of energy and color, the projection of mind-like structure and the clear globe of inner space, are but some of the things from which many life forms are made. Here is suggested a state of being not unlike our own awareness in a form in which we may be reflected. It interacts with environments and extracts or communicates something in the universal scheme of things that only wants to create and procreate. Mind, id, soul, curiosity, instinct, survival, purpose and on and on it goes. To touch the very cosmic fabric of universal being is something we all have in common and pursue in our various and sometimes profound ways. May we never lose sight of how it is that we can connect with all things, always respecting the limitless value of life, allowing for and not prejudiced against difference.